This plant is applied to regenerate and purify the used insulation oil such as transformer oil, switch oil, mutual inductor oil and so on. It can remove water, gas, particle, free carbon, deep oxides and so on. Also it can recover the oil color. After purification, the used insulating oil can reach international standard and recover its original function. 1. 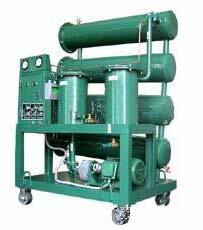 Besides the common vacuum oil purifier’s function of dewatering, degassing and eliminating impurities, this machine can regenerate the seriously deteriorated oil by removing the polarity materials, such as the deep oxides, free carbon in the oil effectively. It can make the seriously deteriorated oil reach to the normal index like anti-oxides, acid- alkali water-solubility. 2. Three ways of using: the vacuum dewatering, degassing, removing impurities system can work independently, so dose the regeneration oil system, and also they can work at the same time. 3. The performance and lifetime of insulating oil will improve and extend awfully after purification and regeneration.